Be a Jury Member! 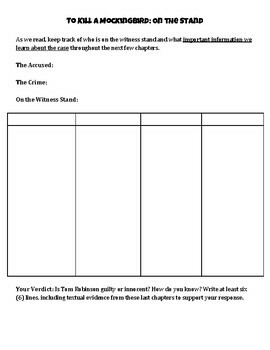 Chapters 17-19 of "To Kill a Mockingbird"
Through this activity, students are asked to be a member of the Tom Robinson's jury and take copious notes on what they hear on the witness stand during the trial. Students will then decide on a verdict prior to reading Tom's actual verdict in the text.